This dish was kind of a mistake and thought up after my first time pepper stuffing disaster. Ok, so I exaggerate a bit, it wasn’t that bad but while trying to seed the pepper I accidentally cut off too much and it just didn’t hold the shape I wanted. Roasted peppers are so darn slippery! So after baking I just chopped it up into little pieces and mixed it all up in a bowl for a nice meal. I figured the next time I’ll just save myself some time and skip the stuffing, which is less tedious and definitely less messy. 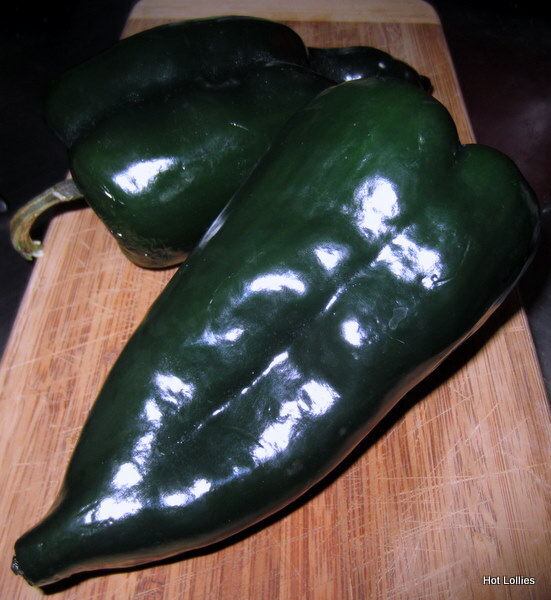 Poblano peppers are great for stuffing because they’re large and one well stuffed pepper can be a meal in itself. It’s a very popular pepper for those who don’t like too much spice since it’s one of the mildest peppers around. I’ve added lots of spice to kick the heat level up but you can adjust to taste. The key to this dish is making sure you roast the pepper well so all the skin falls off and the pepper is nice and tender. The pepper should be almost blackened and blistered. To achieve this you have to rest it over a medium flame and turn on all sides with a kitchen tong. 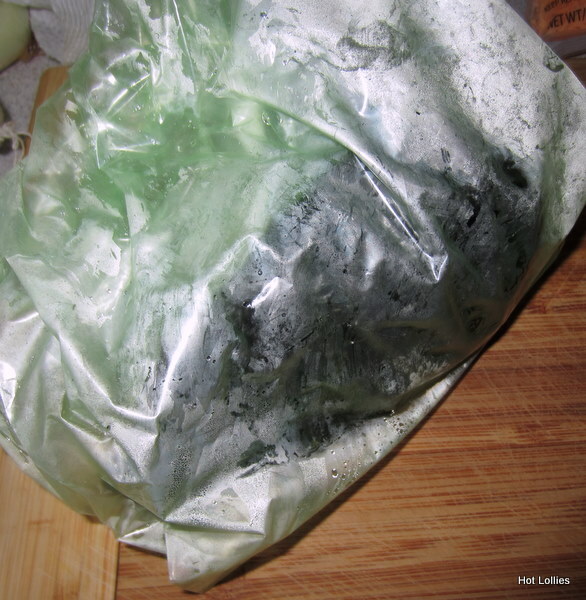 Next you’ll need to let it sweat in a sealed plastic bag so the skin can easily come off. I rub it with a paper towel and skin comes off easily. This dish is pretty hearty since you’ll be mixing seasoned chorizo and rice with the pepper. The mixture should be very moist but not runny. This recipe below makes about 2-3 servings but might be less if your bowls are large. I used ramekins for this recipe but you can also add everything to a large baking dish instead of individual bowls. 1. 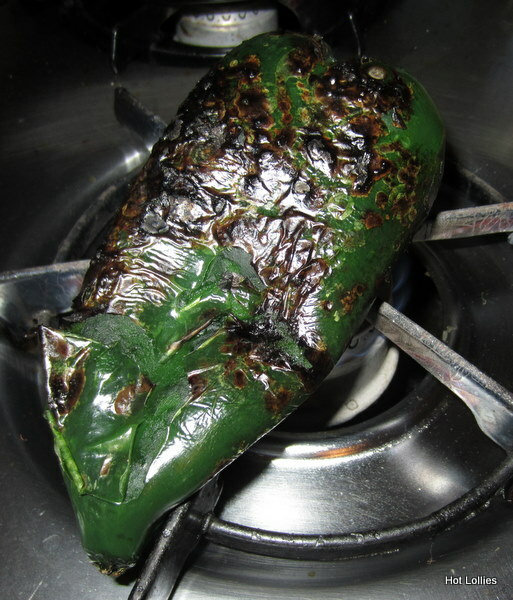 Roast the pepper on stove top on medium to high heat until the skin on pepper blackens and blisters completely. Place peppers in a plastic bag and seal it for a few minutes. Take peppers out and rub skin off. You can wipe with a paper towel and it will come off easily. Seed pepper and cut it into 1 inch strips or smaller if you like. Set aside. 2. Cook a pot of rice, about 1 1/2 cups, and set aside. Rice should be fluffy. 3. Heat oil in saute pan on medium heat and cook onion until translucent. Add the crumbled chorizo and cook through. 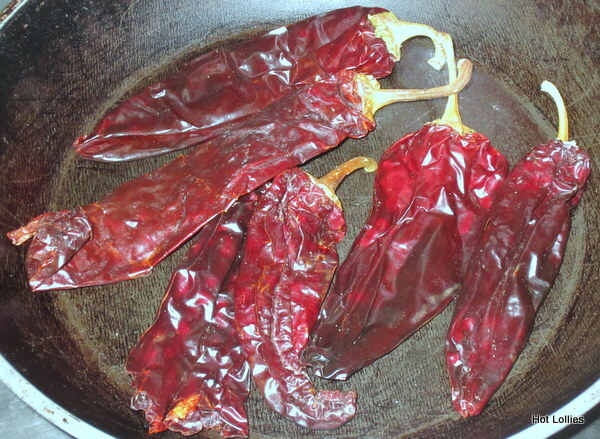 While cooking chorizo, add the the guajillo red sauce, tomato sauce, garlic, salt, pepper, chile powder and jalapeno. Cook for about 10-12 minutes. 4. 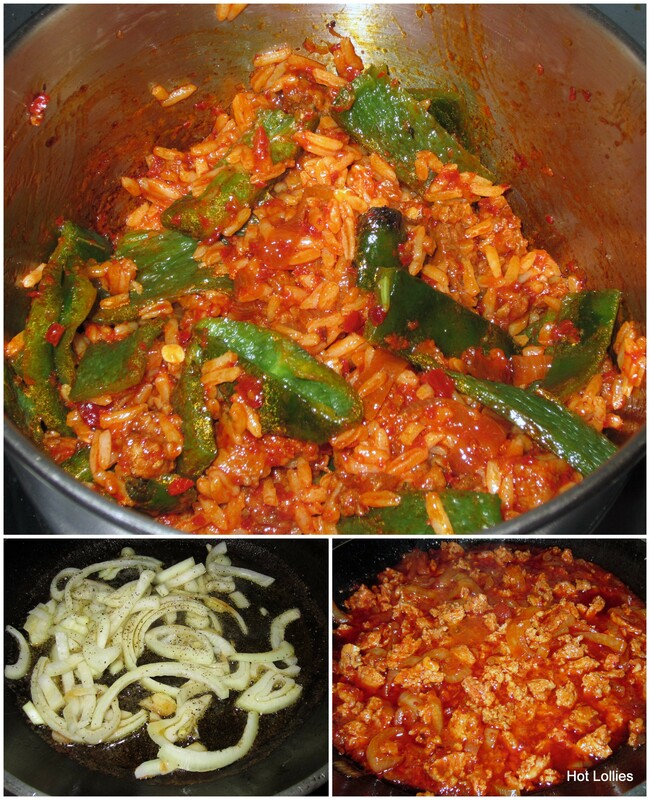 Mix the cooked rice and chorizo in a bowl. Add the chopped roasted pepper and mix well. Fill about 2-3 ramekins bowls with the chorizo, rice and peppers mixture. 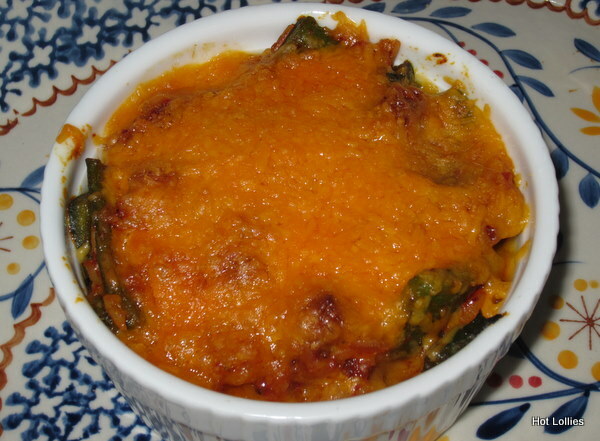 Mix both cheeses together, top off each ramekin with cheese and add a dash of chile powder on top. 5. Preheat oven and set to broil. Place ramekins in broiler until cheese melts and begins to bubble. Remove and serve immediately! You can make this sauce a few days ahead of time if you like. The flavors build after a day or two in the refrigerator and tastes so much better. The red pepper sauce gives this dish a subtle, smoky flavor. Heat dried peppers in saute pan for about 1 minute on each side. Remove stems and seed peppers (this removes bitterness of peppers). Make sure all the seeds are out. Grind up peppers in a coffee grinder until a coarse powder. If you don’t have a coffee grinder, a good blender will work. If you use the blender, drizzle in the oil as you puree. If you use the coffer grinder, add the ground up pepper to a blender and drizzle in oil until sauce forms. Add salt and garlic and blend again. Sauce should be bright red and thick enough to still pour.